Pooled 10ng of each of the libraries prepared yesterday with TruSeq DNA Methylation Library Kit (Illumina) for sequencing at Genewiz. Samples were sent to Genewiz on dry ice via standard overnight FedEx. This entry was posted in BS-seq Libraries for Genewiz, Olympia oyster reciprocal transplant, Samples Submitted and tagged 1NF11, 1NF15, 1NF16, 1NF17, 2NF5, 2NF6, 2NF7, 2NF8, BS-seq, Crassostrea gigas, Katherine Silliman, Katie Lotterhos, M2, M3, NF2_6, NF_18, olympia oyster, Ostrea lurida, Pacific oyster, TruSeq DNA Methylation Library on 22 December, 2015 by kubu4. Re-quantified the libraries that were completed yesterday using the Qubit3.0 dsDNA HS (high sensitivity) assay because the library concentrations were too low for the normal broad range kit. Things look pretty good. The TruSeq DNA Methylation Library Kit (Illumina) suggests that the libraries produced should end up with concentrations >3ng/μL, but we have plenty of DNA here to make a pool for running on the HiSeq2500. This entry was posted in BS-seq Libraries for Genewiz, Olympia oyster reciprocal transplant and tagged 1NF11, 1NF15, 1NF16, 1NF17, 2NF5, 2NF6, 2NF7, 2NF8, BS-seq, Crassostrea gigas, DNA Quantification, Katherine Silliman, Katie Lotterhos, M2, M3, NF2_6, NF_18, olympia oyster, Ostrea lurida, Pacific oyster, Qubit 3.0, Qubit dsDNA HS, TruSeq DNA Methylation Library on 22 December, 2015 by kubu4. Took the bisulfite-treated DNA from 20151218 and made Illumina libraries using the TruSeq DNA Methylation Library Kit (Illumina). 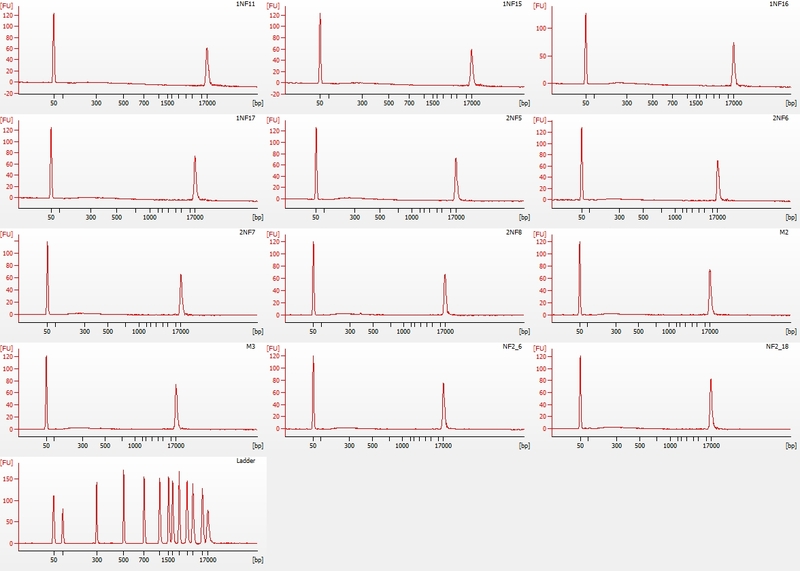 Quantified the completed libraries using the Qubit 3.0 dsDNA BR Kit (ThermoFisher). 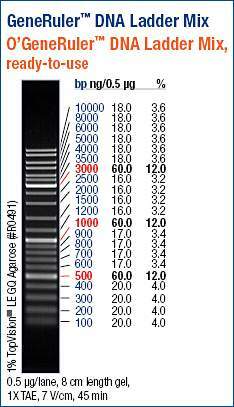 Evaluated the DNA with the Bioanalyzer 2100 (Agilent) using the DNA 12000 assay. Illumina recommended using the High Sensitivity assay, but we don’t have access to that so I figured I’d just give the DNA 12000 assay a go. I used the Qubit’s BR (broad range) kit because I wasn’t sure what concentrations to expect. I need to use the high sensitivity kit to get a better evaluation of all the samples’ concentrations. Ha! Well, looks like you definitely need to use the DNA High Sensitivty assay for the Bioanalyzer to pick up anything. Although, I guess you can see a slight hump in most of the samples at the appropriate sizes (~300bp); you just have to squint. This entry was posted in BS-seq Libraries for Genewiz, Olympia oyster reciprocal transplant and tagged 1NF11, 1NF15, 1NF16, 1NF17, 2NF5, 2NF6, 2NF7, 2NF8, barcodes, bioanalyzer, BS-seq, Crassostrea gigas, DNA 12000 assay, electropherogram, M2, M3, NF2_6, NF_18, olympia oyster, Ostrea lurida, Pacific oyster, Qubit 3.0, Qubit dsDNA BR, TruSeq, TruSeq DNA Methylation Library on 21 December, 2015 by kubu4. Following the guidelines of the TruSeq DNA Methylation Library Prep Guide (Illumina), I ran 1μL of each sample on an RNA Pico 6000 chip on the Seeb Lab’s Bioanalyzer 2100 (Agilent) to confirm that bisulfite conversion from earlier today worked. Firstly, the ladder failed to produce any peaks. Not sure why this happened. Possibly not denatured? Seems unlikely, but next time I run the Pico assay, I’ll denature the ladder aliquot I use prior to running. Overall, the samples look as they should (see image from TruSeq DNA Methylation Kit manual below), albeit some are a bit lumpy. This entry was posted in BS-seq Libraries for Genewiz, Olympia oyster reciprocal transplant and tagged 1NF11, 1NF15, 1NF16, 1NF17, 2NF5, 2NF6, 2NF7, 2NF8, bioanalyzer, Crassostrea gigas, electropherogram, Katherine Silliman, Katie Lotterhos, M2, M3, NF2_18, NF2_6, olympia oyster, Ostrea lurida, Pacific oyster, RNA Pico 6000 on 18 December, 2015 by kubu4. The gel I ran earlier today looked real rough, due to the fact that I didn’t bother to equalize loading quantities of samples (I just loaded 1μL of all samples regardless of concentration). So, I’m repeating it using 100ng of DNA from all samples. Additionally, this gel also includes C.gigas samples that Katie Lotterhos sent to us to see how they look. Ran a 0.8% agarose, low-TAE gel, stained with ethidium bromide. Look at that! The samples look MUCH nicer when they’re not overloaded and uniformly loaded! Most have a prominent high molecular weight band (the band that’s closes to the top of the ladder, not the DNA visible in the wells). All exhibit smearing, but 2NF1 shows a weird accumulation of low molecular weight DNA. Katie’s C.gigas samples (M1, M2, M3) look similar to the Olympia oyster gDNA, however her samples appear to have residual RNA in them (the fuzzy band ~500bp). Will discuss with Steven which samples he wants to use for bisulfite treament and library construction. This entry was posted in BS-seq Libraries for Genewiz, Olympia oyster reciprocal transplant and tagged 1NF11, 1NF12, 1NF13, 1NF14, 1NF15, 1NF16, 1NF17, 1NF18, 2NF1, 2NF2, 2NF3, 2NF4, 2NF5, 2NF6, 2NF7, 2NF8, Crassostrea gigas, gel, M1, M2, M3, O'geneRuler DNA Ladder Mix, olympia oyster, Ostrea lurida, Pacific oyster on 17 December, 2015 by kubu4.